I feel like I’ve said this so many times before, but it’s absolutely true: Flatouts are problem solvers. Protein-packed, fiber-rich problem solvers. When I needed healthier bread bowls and salad croutons? Flatouts had me covered. Fun lunchbox ideas that’d put excitement back in the school lunch doldrums? Flatouts had my back. But really, these cute little Hawaiian Roll Sliders just might be my favorite solution yet! I’ve been making little baked party sandwiches for years and years now. You know the ones I’m talking about. They’re the mini sandwiches slathered in dripping butter and baked up all toasty and golden, often dotted with poppy seeds. They’re warm and melty, sort of savory-sweet, and way more delicious than you’d think a miniature deli sandwich possibly could be. Over the years, I’ve tweaked and improved, tasted and re-tweaked – trying to make those little sandwiches healthy enough that I could feel ok about serving them to people I cared about, while still keeping them so delicious that nobody noticed they were healthier (that’s really always my goal here at THK, you know! 😉 ). Way back when I first embarked on this little sandwich journey, I started off working from a couple of Ham and Swiss Appetizer Sandwich recipes from my dear friend Lisa, and from Allrecipes. But OH.My.Goodness! Both recipes called for an entire cup of butter. No. Just NO. I knew I could do better than that! So, over the years, I’ve slashed the butter … and also created my own flavor variations with different meats, lean cheeses and flavored mustards. 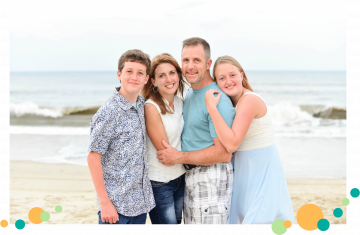 (You’re actually getting three – that’s right THREE! 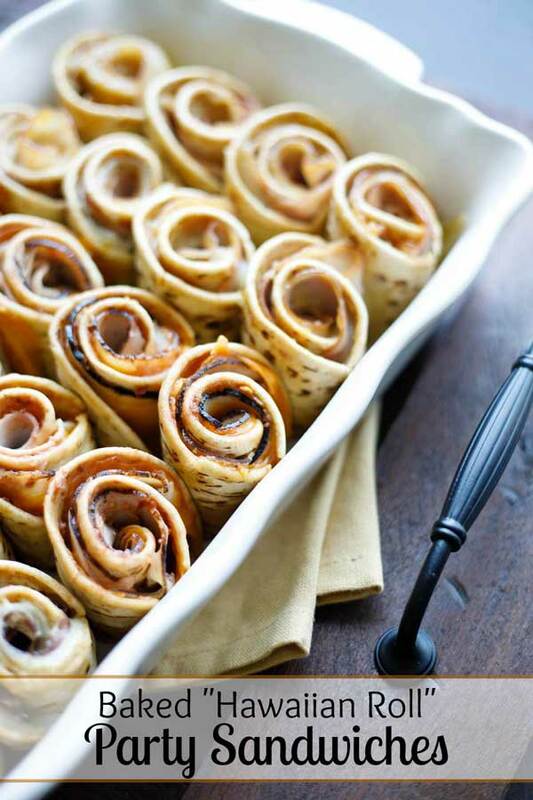 – yummy variations today, all in one recipe! #BONUS). Everyone still loves them (and debates which flavor combo is their fave), and nobody misses all that extra butter even one tiny bit. Still delicious, still fun and party-worthy for special occasions. BUT … I’ve always had a nagging feeling that I could improve them even a teeny bit more – that my work here wasn’t quite finished. Mostly, I just didn’t love the bread options I had – a lot of not-very-nutritious white carbs. Well Hello, Sweet Hawaiian Flatbreads! When I heard Flatout was launching several yummy new flatbread flavors this summer, you can bet my mind started running through all the glorious possibilities. Mmmmmmmm … Olive Oil & Sea Salt, Southwest Chipotle, and Garden Ranch … all with pumped-up protein and fiber, and just 60 calories each! Yes, please! But the new offerings also included (you guessed it!) Sweet Hawaiian Foldits. Those really caught my attention, because I knew just what I wanted to do with them! Hawaiian Roll Sliders!!! Modernized, revamped and reincarnated into fun spirals with waaaaay more nutrition yet still all that party sandwich flavor goin’ on! Those new flatbreads were the solution I’d been waiting for, the final tweak that my baked sandwiches had needed! 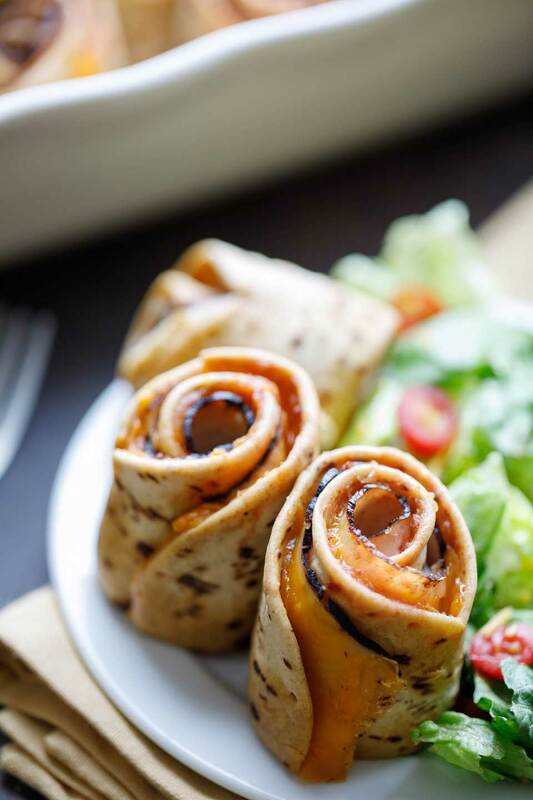 And hey hey … these cute little mini sandwich roll-ups are really easy to make, too! 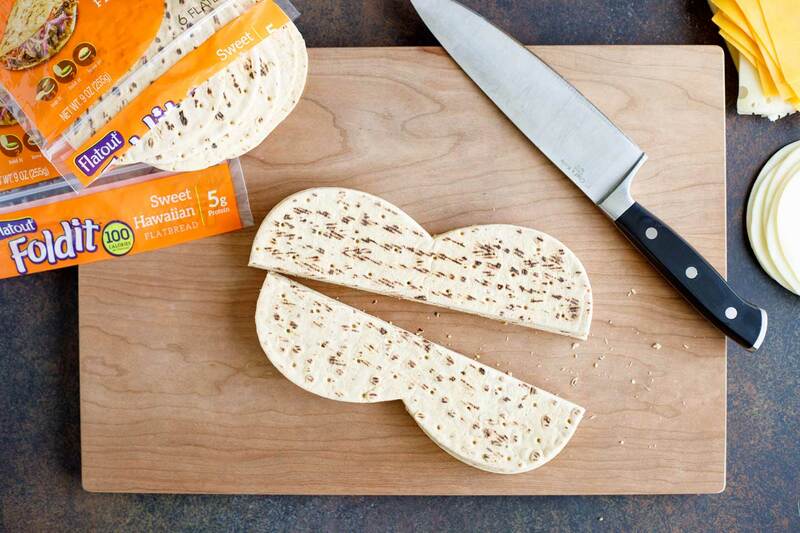 1) Slice your Sweet Hawaiian Foldit flatbreads in half, lengthwise. I usually pile about 6 of them up at a time and carefully cut down through the entire stack. 2) Mix up the “Buttery Spreads”. (Oh yum!) I use a slightly different spread variation for each of the three sandwich types, but you can change it up and get creative … more on that later. A couple of notes here, though: because we don’t want those yummy spreads to get too melty and become runny or greasy during baking, notice that you don’t want to melt the butter before mixing it with the other spread ingredients. Ideally, you just want it to be softened. Also, I recommend finely grating your onion, rather than chopping or mincing it. The onion ends up the perfect consistency, without noticeable bits like you’d have if you’d chopped it up instead. It adds stealthy flavor without screaming its presence. 3) Slather about 3 tablespoons of one flavor of “Buttery Spread” evenly across 8 of the halved flatbreads. 4) Then top with the cheeses. Divide each cheese evenly among the the flatbreads, so none of your spirals gets gipped and ends up skimpy on the fillings. 5) Next, top with the meats. Again, divide it all out evenly. 6) Roll ’em up! Just don’t roll so tightly that all the spreads and fillings squeeze out. 8) Repeat with the remaining 16 flatbread halves, and the remaining spreads, meats and cheeses. 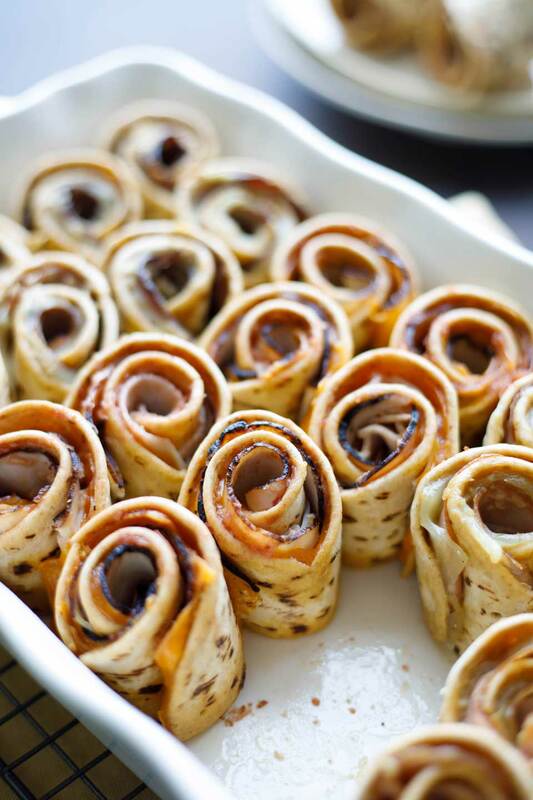 You’ll have 24 adorable little spiral sandwiches. 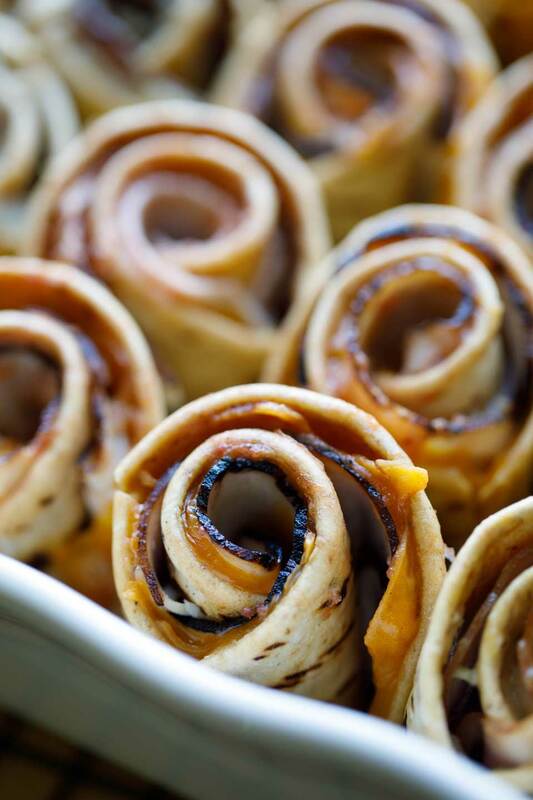 9) Brush the top of each type of spiral with the remaining tablespoon of its yummy, Buttery Spread. • Prep Ahead (Without Baking) – You can completely assemble these mini Hawaiian Roll Sliders up to about a day before you bake them. 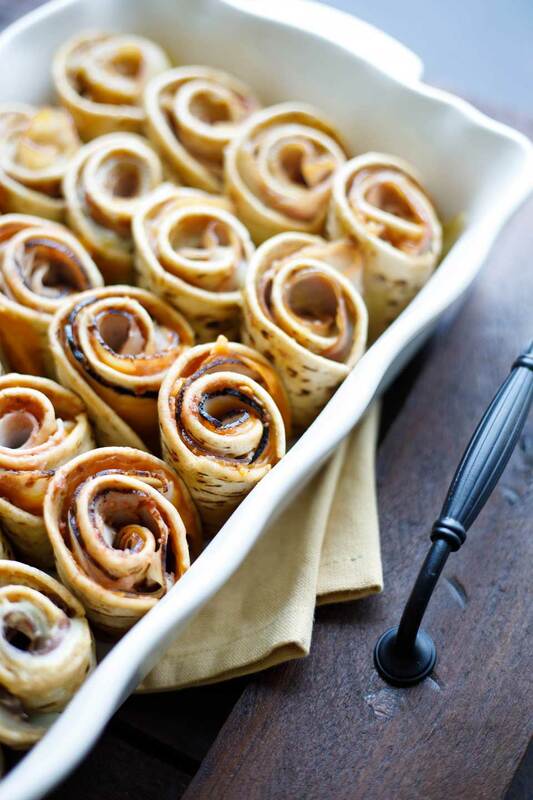 Just cover them with foil and refrigerate until you’re ready to bake. 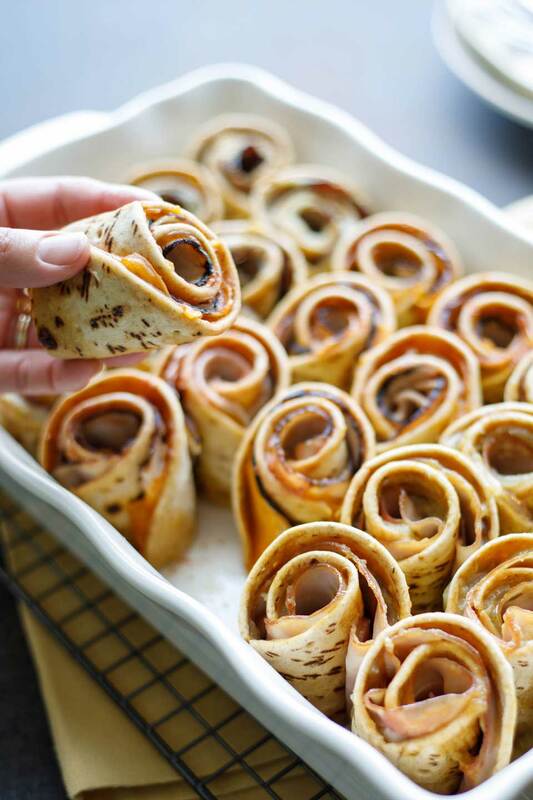 Definitely a busy host’s dream – you can pop these in the oven right before your party starts, then relax and enjoy your guests while delicious things magically appear, piping hot from your oven! 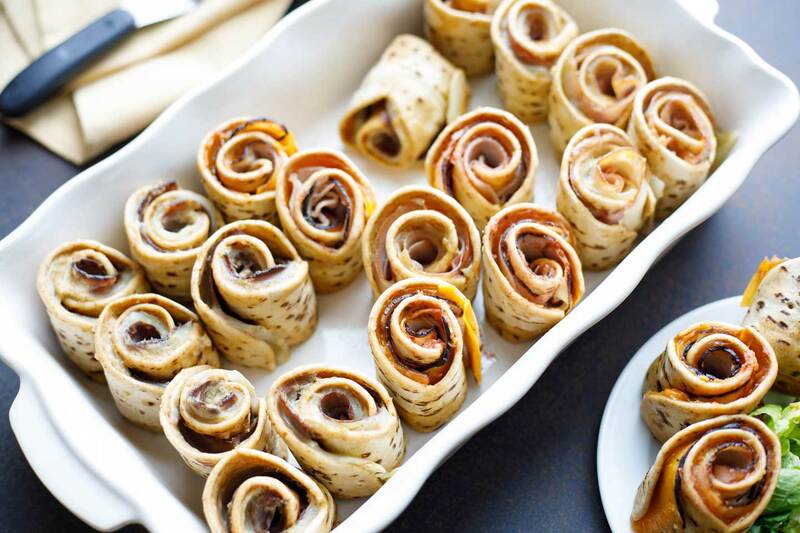 • Completely Bake Ahead – You can also go even further and bake these off, then cool them down and refrigerate them (already fully baked) for grab-and-go snacks or mini meals all week long. When I was testing and retesting this recipe, we had quite a few of these completely finished, little baked sandwiches lurking in our fridge for several days. All week long, we could grab one or two whenever we needed a quick bite as we dashed through the kitchen. Once baked and cooled, they’re terrific gently rewarmed in the microwave, for maybe 10-15 seconds each (depending on how powerful your microwave is). Appetizer Party Sandwiches or Main Course? No identity crisis here. 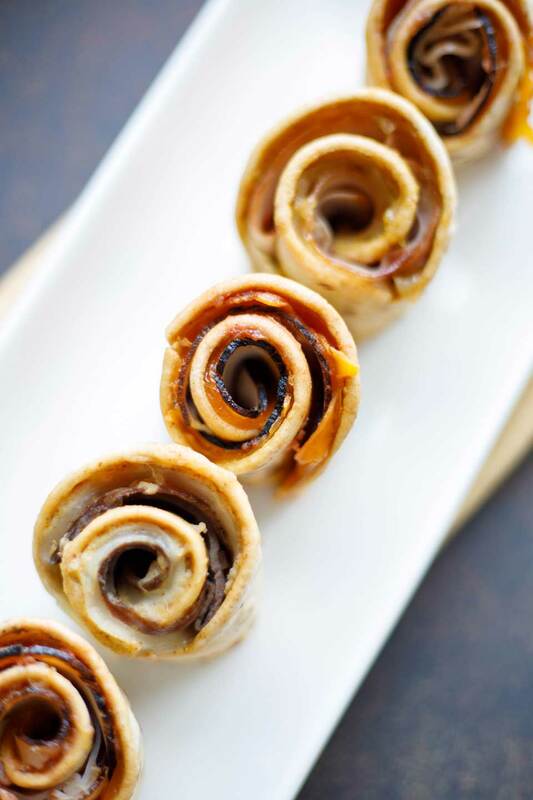 These little sandwich spirals are happy to join in pretty much any meal, any occasion! Appetizer Sandwiches – I know a lot of people think of baked sandwiches like these as party appetizers. And they definitely can be! In fact, since the pretty spirals let you peak at all the warm, melty fillings waiting inside, this flatbread version of the classic baked sliders is even more enticing at parties and potlucks. They’re not too messy, either – so guests can walk and munch and chat and mingle, without worrying about dropping food all over their party duds. Dinnertime Main Dish – But, sometimes we also make these as more of a main course. Grab two or three and serve ’em up with a salad or alongside soup or chili, and call it dinner. Snacks and Lunch Boxes, Too! – And, like I mentioned above, once they’re baked, these are terrific to keep on hand for quick snacks or to throw in lunch boxes. You pretty much can’t go wrong! So, today’s recipe is really like three recipes in one (yay – bonus!). You’ve got three different flavor combos, all together in one pan. It looks pretty, and it’s fun at parties for guests to try different flavors and compare which ones they like best. You often see baked party sandwiches like these made specifically as ham and swiss sliders, but over the years, I’ve tried out other combinations, until I ended up with three different options that we can’t do without. • Mix and match different types of meats and cheeses. When possible, though, we always recommend that you slash some calories and saturated fat by choosing reduced-fat cheeses, and that you look for natural, minimally processed lunch meats. 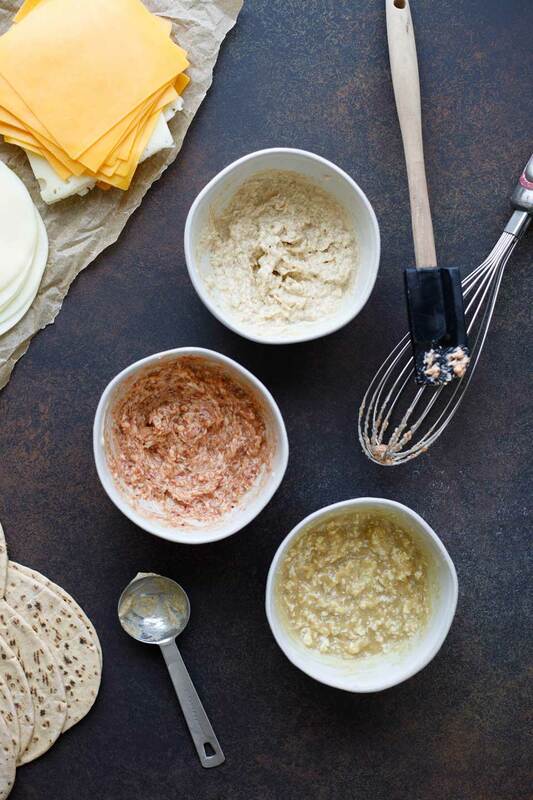 • Change up the delicious “Buttery Spreads.” Can’t find cranberry mustard for the Turkey and Cheddar spirals? Don’t like horseradish mustard? 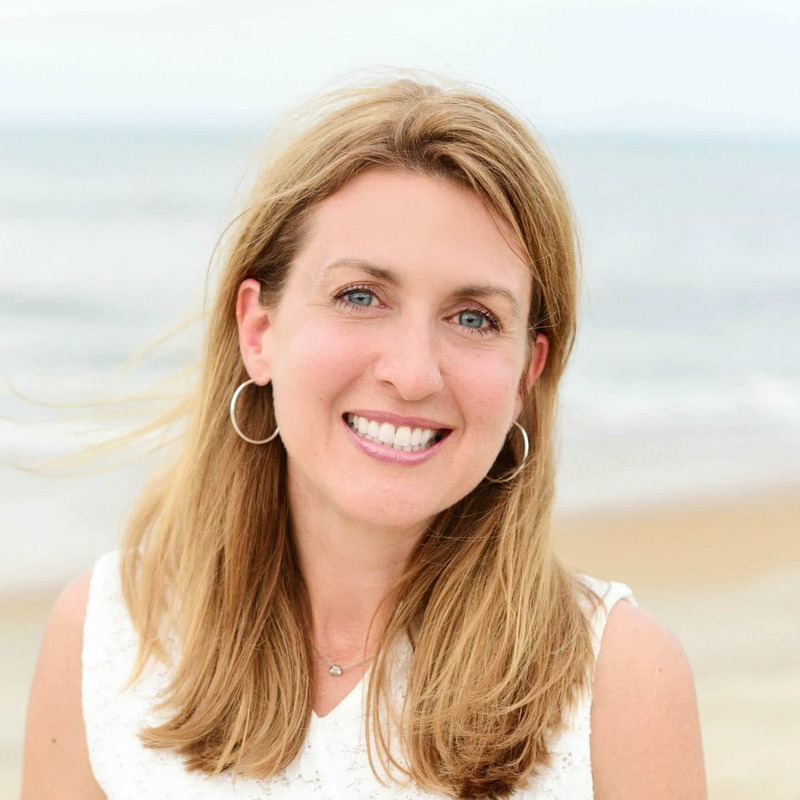 No worries – switch it up! Or, keep things super-simple and just use smooth Dijon mustard for all three. Trust me – still delicious! • Double or triple the amounts for your favorite kinds. Love the Roast Beef and Provolone? 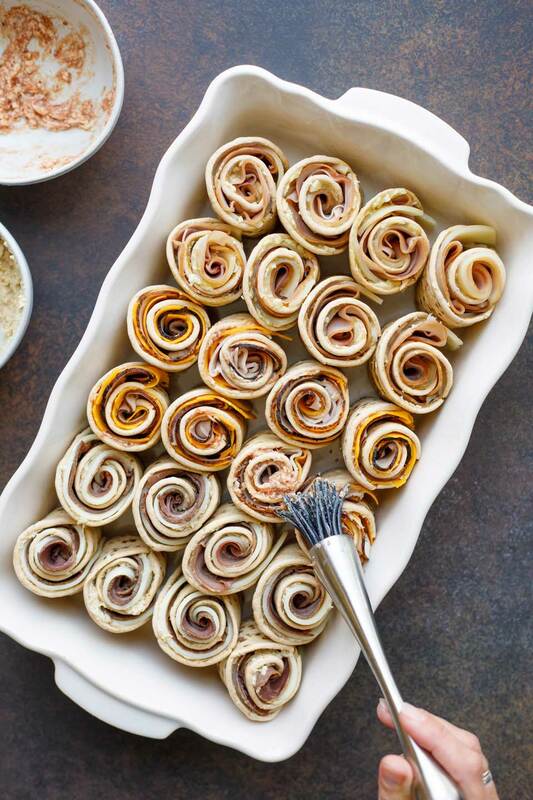 Go ahead and make an entire pan filled with just those! Don’t like the Turkey and Cheddar as much as the Ham and Swiss? Then double up on a fave and ditch the other. It’s really easy to adjust the quantities! In fact, when I make baked sandwiches for big parties, I typically make an entire, separate pan of each kind (yep – three pans!). And people really do stand around tasting and munching and debating their favorites (great little party ice breaker, actually!). I saw this coming, and I’ve gotcha covered. With how popular Flatouts have become lately, sometimes I find that my store’s run out of a certain type, right when I need it. But I repeat … don’t panic! We also tested this recipe for you with other Flatout Foldit flavors, and every one of them was great. I especially recommend the whole-grain-filled 5 Grain Flax variety. 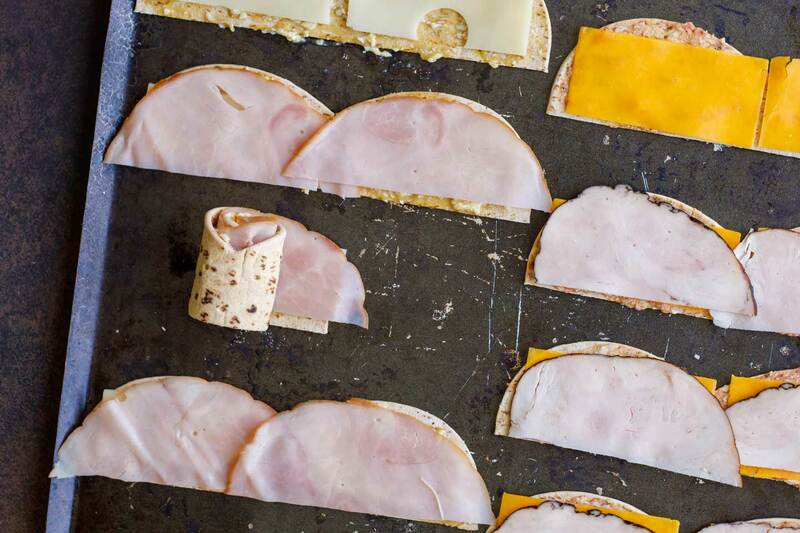 In a pinch, you can definitely play around with other flatbread varieties – just one more way to customize your little sammies and really make them your own! So … those poppy seeds. Seems like most of the Hawaiian Roll Slider recipes you see out there have poppy seeds – either mixed in with the butter spread, or sprinkled on top of the sandwiches (or both). I’ve tried it, and I just don’t get it. As far as I can tell, the only possible thing poppy seeds contribute here is that they generate more party convos as everyone uncomfortably asks each other whether they’ve got black dots wedged between their teeth. Really, I recommend skipping the poppy seeds. But hey, you do you. I’ve mentioned about 3,000 times now that this recipe is super customizable. If you’re a poppy seed fan … then go for it! 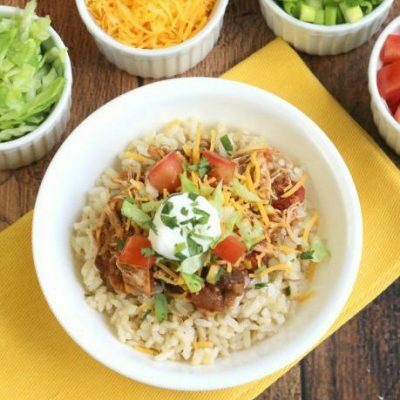 Make ’em ahead, and customize them any way you want … for parties, for dinner, for just-because-they’re-quick-and-awesome! These cute mini sandwiches seriously have it allllll going on! And finally, finally, I feel like I’ve completed my quest to make baked sandwiches that are truly the very best, yummiest, and healthiest they possibly can be. And now you can up your own baked sandwich game, too! (Everybody’s got a baked sandwich game, right?) 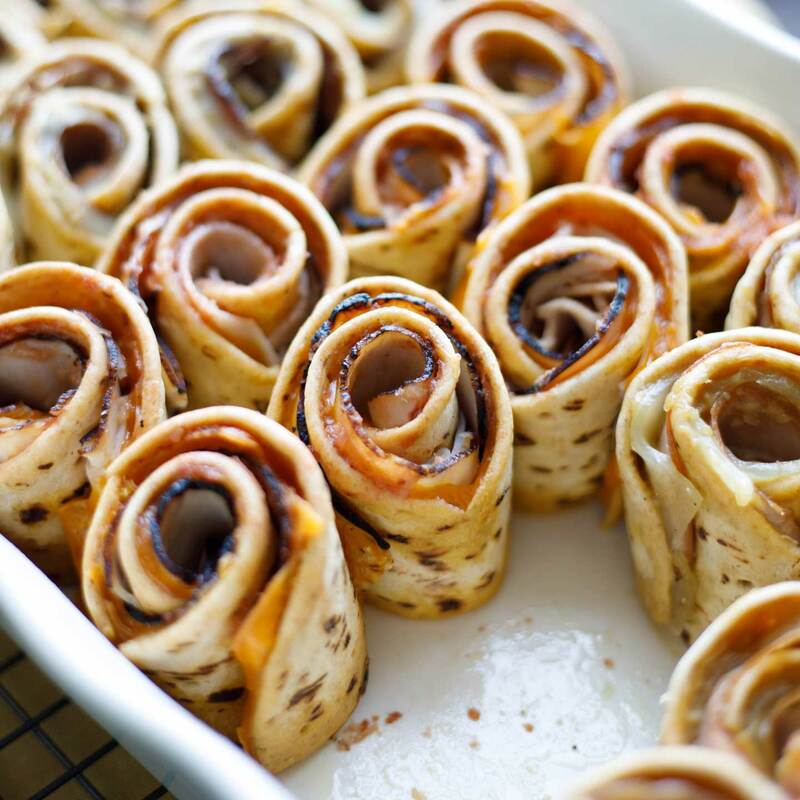 Make these … and you’ll never look back! An updated take on those always-popular baked party sandwiches! 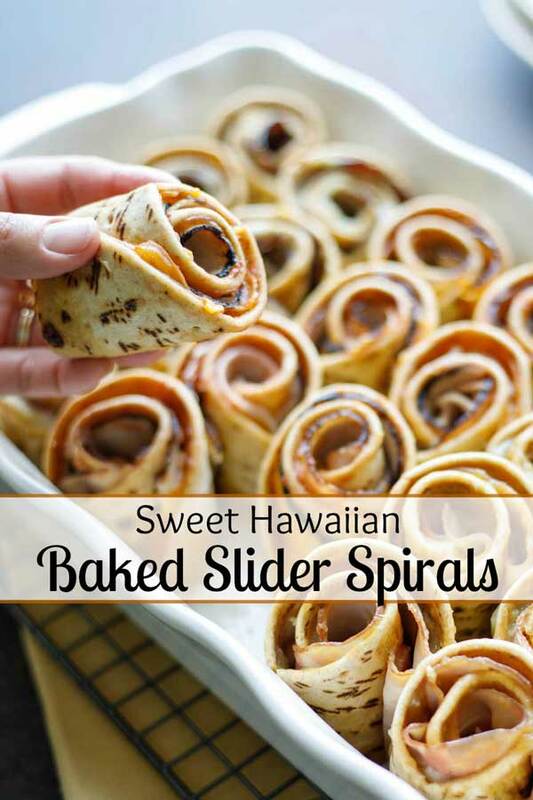 These cute Spiral Hawaiian Roll Sliders are easy to make, super adaptable (we've got 3 different variations), and so much healthier, too! 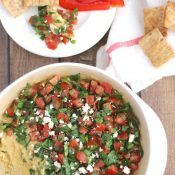 Make them ahead for stress-free party appetizers, easy dinners, or even grab-and-go snacks and lunches! 2) Cut all 12 of the Flatout Foldits in half longways (refer to photos in post if needed), to yield 24 halves. Set aside. 3) In three small, separate bowls, combine the "Buttery Spread" ingredients (butter through Worcestershire sauce) for each type of sandwich. Whisk or stir to combine thoroughly (but note in the post's photos that the Buttery Spreads will still look a little lumpy from the onions and from bits of butter). Set aside. Evenly slather 8 flatbread halves with 3 tablespoons of the Buttery Spread (reserving about 1 tablespoon). 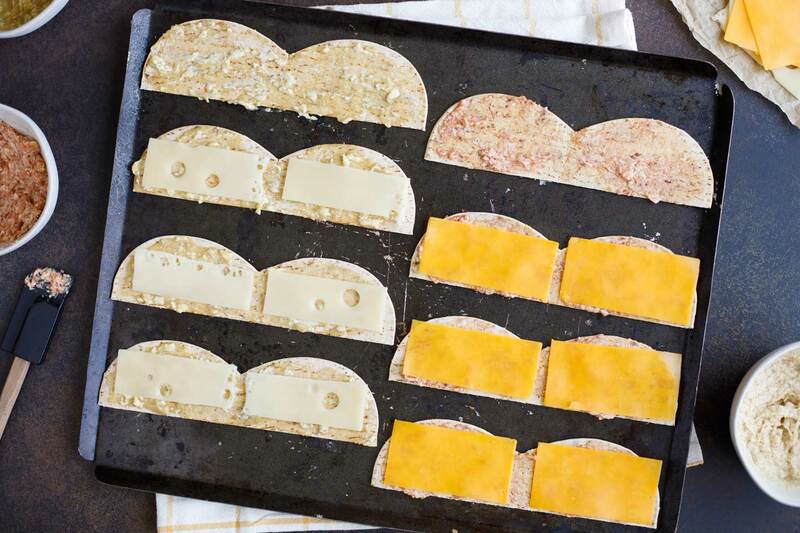 Top with cheese, dividing the cheese evenly among all 8 flatbread halves. Next, top with meat, dividing evenly. Roll each of the 8 sandwiches into a spiral and place it, cut side down, into an ungreased 11x7-inch baking dish, tucking in edges so spirals stay closed during baking. Using a pastry brush or rubber spreader, dab the reserved 1 tablespoon of the Buttery Spread evenly across the top edges of the 8 sandwiches. 5) Repeat this process with the next two types of sandwiches, beginning with slathering the Buttery Spread on the flatbreads, then adding cheese, then adding meat, then rolling up and dabbing the tops with a little more of the Buttery Spread. Flatbreads: If your store doesn't carry the Sweet Hawaiian variety of Foldit flatbreads, feel free to experiment with mixing and matching other Foldit varieties. We've also tested this recipe with the 5 Grain Flax and the Ancient Grains varieties. 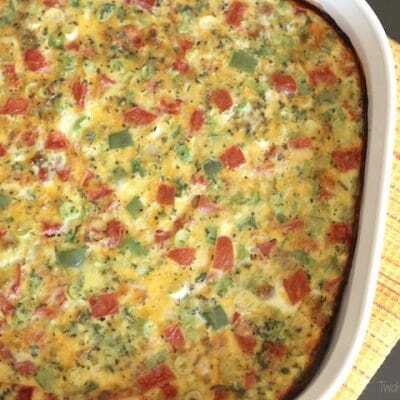 Both are delicious with this recipe, and both are loaded with protein, fiber and whole grains. Note, however, that some varieties have 5 flatbreads per package, while others have 6. You will need a total of 12 flatbreads to yield the 24 sandwiches in this recipe. 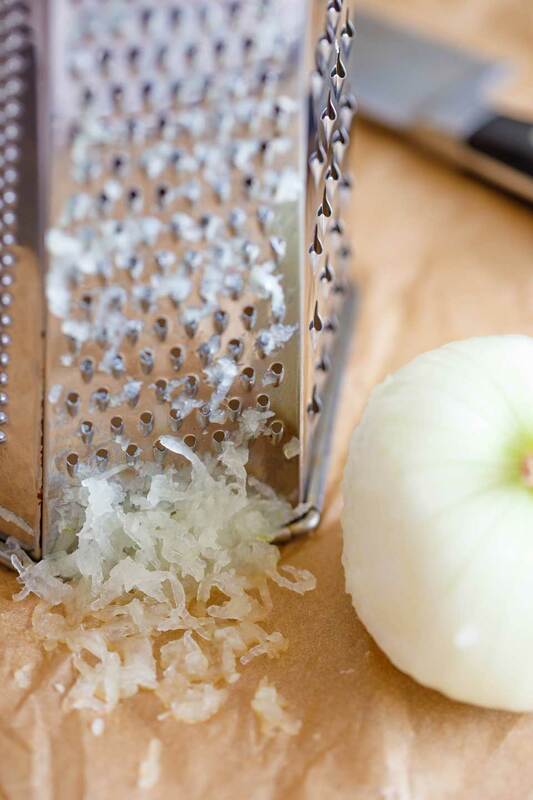 Grating onion: As shown in the photo in the post above, we recommend grating the onion on the medium-sized grater side of a box grater. 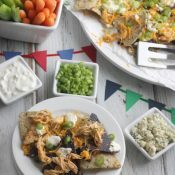 Swapping meats, cheeses and spreads: As mentioned in the post, feel free to experiment with different combinations of flavors, or even to fill an entire pan with all one type of sandwich if you have a favorite. 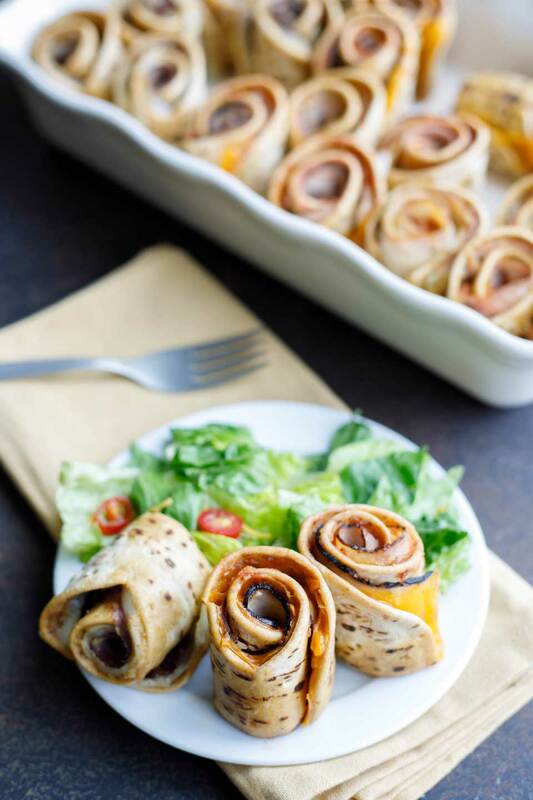 Make-ahead options: You can completely prepare these spiral slider sandwiches prior to baking, up to a day in advance, which is great for parties and entertaining. Simply cover the baking pan and refrigerate until baking. Nutrition information should be considered an estimate only, and may vary depending on your choice of ingredients or preparation. No guarantees are made regarding allergies or dietary needs. Always consult a physician or dietician for specific advice and questions. WOW!! Look. at. those! Great idea, amazing pics.. mouthwatering recipe. I love everything about this. Super veratile and great to know these can be made ahead of time. What a fun twist on sliders! I’ll definitely be filling this away for our next get-together! These sound incredible, my family would really enjoy them. 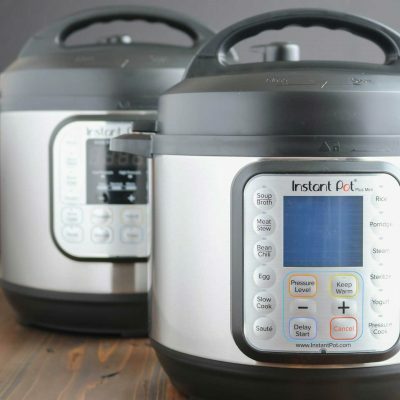 I can’t wait to give them a try! These sliders look so good! They will be perfect for my bbq next weekend!! 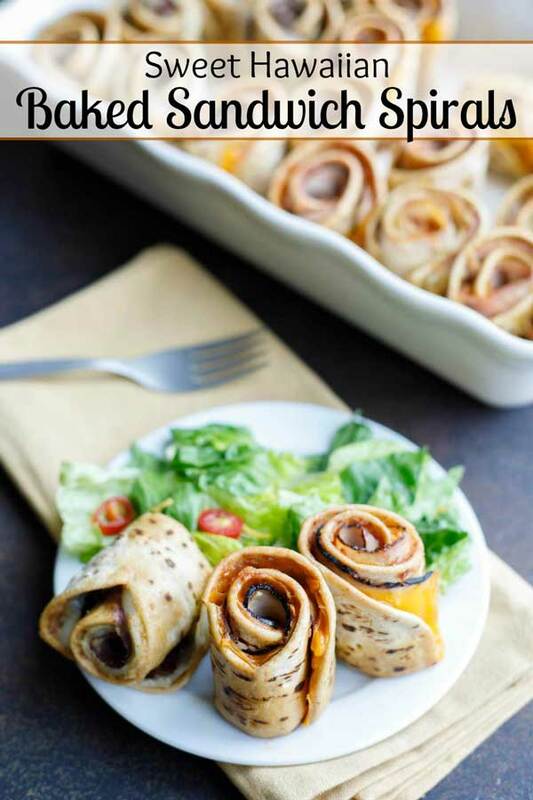 These are so fun and look absolutely perfect for a pot luck or bbq this summer! Far easier to manage than a sandwich! I love that you can customize with your own meats and the all the different sauces sound so delicious. Why buy flatbreads? Make them yourself and then you know exactly what’s gone into them.and they’ll be less expensive. Perfect finger food! And you’re totally right about poppy seeds! Plus I’ve heard of people failing drug tests! Not something most people worry about, but my circle of friends includes people with government clearances. These are such a great way to cut back on the bread without missing out on those delicious baked sliders that we all love at parties. 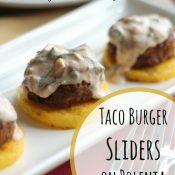 I’m definitely trying this the next time I make sliders! I want to try the roast beef sliders. I love roast beef with horseradish. These look so good! I use Flatout wraps, but I haven’t seen the Foldits in my store yet. I’ll have to check with them about getting it. These little sliders do sound addictive! These look so great! Those ham and cheese sliders are SO good, but man – that butter! 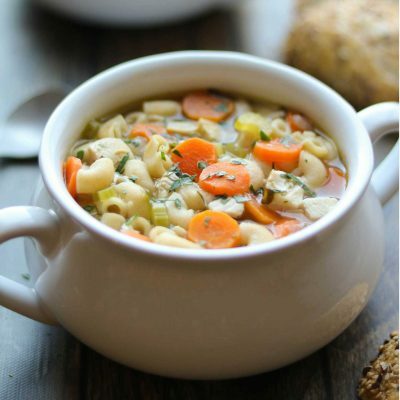 Love this easy and healthy alternative! Totally keeping this in my back pocket for the next party!